Five Australian former prisoners of war catch up on news from home after their release from Japanese captivity in Singapore, September 1945. 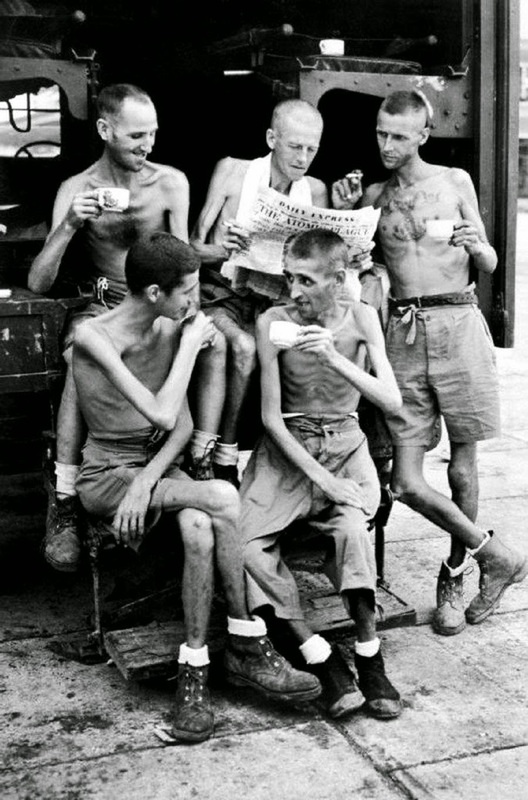 Five Australian former prisoners of war of the Japanese relax with cups of tea and a newspaper after the Japanese surrender. The brutal treatment inflicted upon these men by their Japanese captors is clearly illustrated by their poor physical condition. These prisoners were held on the Changi POW camp. Often thought to be synonymous with horror it was in fact a relatively comfortable camp, at least compared to those on Borneo, Ambon, Hainan, Japan and the Thai–Burma railway. The Japanese used the POW’s at Changi for forced labor. Men were made to work in the docks where they loaded munitions onto ships. They were also used to clear sewers damaged in the attack on Singapore. As the end of the Pacific War approached, rations to the POW’s were reduced drastically. To be more precisely ration scales were reduced even for the Japanese as resupply from outside Malaya/Singapore became more difficult as the war progressed. It must be noted that at the same time Japanese front line troops were dying of starvation in New Guinea (and turning cannibal if eye-witness accounts are to be believed). Individuals experiencing starvation lose substantial fat and muscle mass as the body breaks down these tissues for energy. Depending on the level of starvation the full recovery might take as long as one year. There have been cases when prisoners have died from eating too much afterwards. This is called Refeeding Syndrome which is a syndrome consisting of metabolic disturbances that occur as a result of reinstitution of nutrition to patients who are starved or severely malnourished. That’s why recovering patients are only to be given water, milk, and juices for the first 3-5 days of recovery. When individuals who are starving suddenly get given a bunch of food, their body switches quickly from eating itself to rebuilding. This causes big shifts of minerals out of the blood and into the cells, and blood levels plummet, where previously they were being artificially maintained. It’s actually got a mortality rate of about 20%. Most of the research on it was done after all these individuals getting out of POW camps were stuffed with food and died instead of recovering. They need to slowly bring starving people back to normal calorie diets, and watch their blood chemistry closely. The newspaper the soldier was reading is “Daily Express”, dated September 5th, 1945. 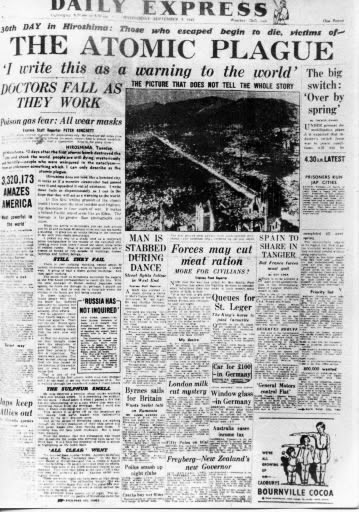 The headline: “30th Day in Hiroshima: Those who escaped begin to die, victims of – The Atomic Plague”. Picture. (Photo credit: Australian War Memorial). Interestingly they are not reading the front page about Hiroshima but have turned to the back page to read the sport. Besides, if I was them I would have a gutful of the war by then too. war or death camp unlucky souls to help them recover. NOW I KNOW! So thanks! Does it look like these guys were held in a "relatively comfortable" camp? What an ignorant thing to say in paragraph one of this article! I have noticed though out this site there are many grammatical errors and odd opinions written by the site owners about various photos. I am wondering is there a lost in translation problem going on? What opinion?Its pretty much a fact that Japan had some of the most brutal POW camps in the whole war.While starving in a labor camp is horrible its better than being forced on a Death March or used in medical experiments. the 'relative comfort' is reflected in the fact that they are alive. The prisoner holding the newspaper in this photo happens to be my Uncle. He was a prisoner for 3 years and after coming home was a very changed man. He was never the same, not only was he physically damaged for the rest of his life but mentally damaged also. They were treated very badly indeed. Do you by any chance know the identity of the prisoner on the left side in the front? My uncle Alan was captured by the Japanese in Burma: my mother (now 86) said he was held in an American field hospital camp, near where they lived, for about 6 months when he got back after 1945. He was much like the men pictured, a living skeleton, and had suffered great mental and physical torture. He naturally was never what you might refer to as "stable" after this, and for many years used to send family members great long letters on religion and conversion (prior to the war he was not particularly inclined this way at all. The things he described in the camps was unrepeatable.